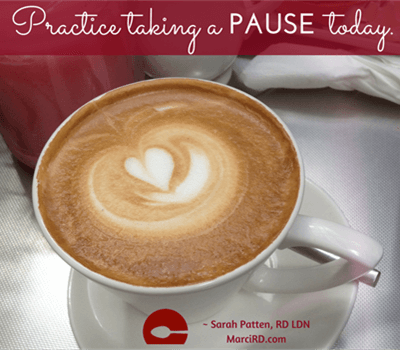 Practice Taking a Pause - Marci R.D. One of my favorite routines after getting out of bed in the morning involves making a steaming hot cup of coffee and taking a moment before taking my first sip to pause, gaze out my kitchen window, and set an intention for my day ahead. This ritual started a couple of years ago as I began to realize how busy the days can be and how easy it is to fill the waking hours to the brim without taking the time to slow down and check in. I found myself talking with clients and friends about the importance of mindfulness, self inquiry, and pausing, but realized that I too needed to hear that message and bring focused attention to sloooowwwwwwwwwingggg down. At first, I had to remind myself to take that moment or would chide myself with self-criticism if I’d rushed around after waking up too late/hitting snooze and had forgotten about the intention to set an intention altogether. Just like any type of habit change, however, with enough practice and repetition, the new ritual stuck and now it’s the part of my morning I look forward to most. This “mindfulness moment” allows me the opportunity to assess how I’m feeling, what I’m grateful for, what I’m worried about, and what I’d like to practice for the day ahead. Solidifying this habit in the morning has also helped to make it much more natural to return to this practice throughout the day. Maybe it’s taking a moment to check in while waiting in line at the grocery store, sitting down to eat lunch, or washing dishes at the end of a long day – wherever it may be, the realization that there IS time to take time throughout a busy day has been a huge change for me. We all have the ability to slow down and check in with ourselves, no matter how full our time may seem. “Take time to notice what’s right in ourselves, in others, and in the world around us. We may become so concerned with correcting ourselves we become habituated to seeing what’s wrong. Not just seeing it – constantly looking for it. The question itself – What’s wrong? – is enough to keep us on edge. “There are times to take stock, do an inventory. Times to learn and grow. But spirituality and joy do not stem from trudging around in the muck of what’s wrong with others, ourselves, and life. We do not have to seek out mistakes and errors, poking and picking at ourselves to continue our growth. Poking and picking hurts. Our lessons will be revealed to us, and they will present themselves naturally. Growth will occur. So, with that, I’d challenge all of you to practice taking a pause today (and maybe eventually every day) to acknowledge what’s right. Give yourself the gift of self compassion, give yourself some space from that internal critic, and call out a strength you possess – even if it seems tiny or insignificant. With practice and persistence, everything gets easier.